We keep a wide variety of both new, rebuilt and used equipment in stock, so we’re ready when you need us. Additionally, with over 70 years in business, we have a huge body of vendors we can call on to find whatever you may be looking for, if we don’t have it here. Just a few of the items we keep are: New H.D. 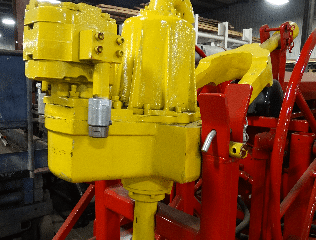 1200# 24″ Blocks, Deck Engines, Twin Disc & WPT Clutches, Tong Lifting Cylinders, V-Belt Sheaves, 120 gal. Fuel Tanks, 120 gal. Hydraulic Tanks, Mud Pumps, Power Swivels, Drop Boxes, Tanks, Power Towers, Transmissions, Floats, Substructures, Hydraulic Helper Winches, Crown Sheaves, Bearings, Drums, Draw Works, Poles (new & used), Pole Push Over Cylinders, Role Raising Winches, Hydraulic Jacks (new and used) with safety wings, and many, many other things. Floyd's Welding Service provides used oilfield equipment and more to clients throughout Olney, Vincennes, Effingham, Salem, Fairfield, Louisville, St. Elmo, Griffin, Crossville, and surrounding IN and IL communities.